Dust the chicken with flour. Lightly spray a deep frying pan with oil and set over a medium heat. Cook the chicken, turning occasionally, for 5 mins until golden brown on both sides. Remove and keep warm. Add the onion, garlic and carrots and cook for 5 minutes. Return the chicken to the pan and add the rosemary, stock and tomatoes. Cover and simmer gently for 40–45 mins until the chicken is cooked and the sauce has reduced. Season to taste. While the chicken is cooking, cook the pasta according to the instructions on the packet. Drain well. Meanwhile, make the smashed beans: lightly spray a small pan with oil and gently cook the onion and rosemary over a low heat, stirring occasionally, for about 10 mins until really tender. Remove the rosemary and blitz the leaves with the beans and lemon zest to a thick purée in a blender or food processor. Stir the purée into the onion in the pan and heat through gently for a few minutes. Season to taste. 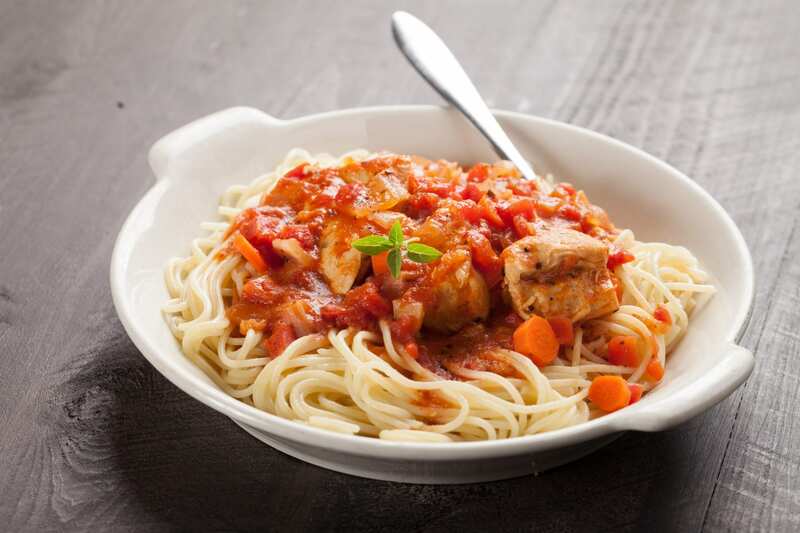 Serve the chicken and sauce, garnished with rosemary, with the smashed white beans and pasta. If you enjoyed this recipe, try our chicken satay.